The Beachcomber Lake Rake removes weeds at the roots. The Beachcomber™ Lake Rake is a specially designed pond and lake weed beach rake that pulls out the entire plant, preventing future growth. Also effective at removing dead leaves, sticks, and other debris. A lightweight and durable lake weed rake. 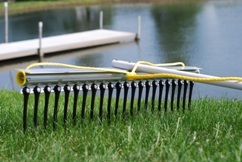 The Beachcomber™ Lake Rake removes weeds at the roots. A durable lake weed rake that handles even the most stubborn weeds and delivers and clear, sandy lake bottom. Works as a pond rake, the Beachcomber lake weed rake can restore any murky pond to its prior beauty. Manufactured by Shoreline Services, Inc. Does not work well on a heavy infestation of water shield which had covered our pond. very hard to pull thru this weed.